Donald Trump will be sworn in as the President of the United States of America on Friday 20th January, and many people are scratching their heads and wondering how this has happened. Trump defies all conventional rules of politics. He’s a former reality television star who seems to take pleasure in offending entire groups of people, such as Mexicans, the disabled and Muslims. Trump seems to be an anomaly. 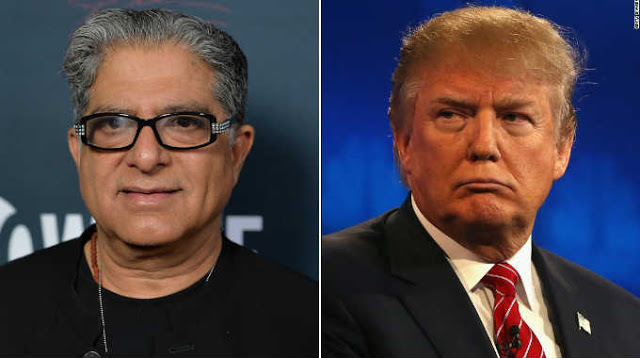 Yet the author and doctor Deepak Chopra has a different perspective on the emergence of Donald Trump. Chopra says Trump’s success comes from a side of human nature that exists inside all of us, and offers some steps for how we can combat this. “In reality Trump isn’t bizarre or anomalous. He stands for something universal, something right before our eyes. It’s an aspect of the human psyche that we feel embarrassed and ashamed of, which makes it our collective secret. Going back a century in the field of depth psychology, the secret side of human nature acquired a special name: the shadow. According to Chopra, the shadow side is inside all of us, and it’s something we need to face head on. The danger that Chopra foresees is the shadow forces getting out of control, as we saw in the first half of the twentieth with two world wars. Therefore, Chopra offers each of us some steps for looking within and confronting the shadow side that exists in all of us. After all, the best way to change the world is to change ourselves. 01. See Trumpism for what it is, a confrontation with the shadow. 02. Instead of demonizing him, acknowledge that the shadow is in everyone and always has been. 03. At the same time, realize that the shadow never wins in the end. 04. Find every opening to reinforce the value of returning to right and reason in your own life. 05. Don’t fight the shadow with the shadow, which means not stooping to play by Trump’s nihilistic rules—he will always be willing to go lower than you are willing to go. This post was republished from thepowerofideas.ideapod.com. You can find the original post here.